In the occupied Crimea graffiti appeared in support of Ukrainian political prisoners Oleg Sentsov and Oleksandr Kolchenko, according to the information in the Save Oleg Sentsov group on Facebook. “Today an additional graffiti appeared in Crimea completing the general idea of the Russian state. Artists support Oleg Sentsov and convey that he has supporters in Simferopol,” said the caption to the photo. 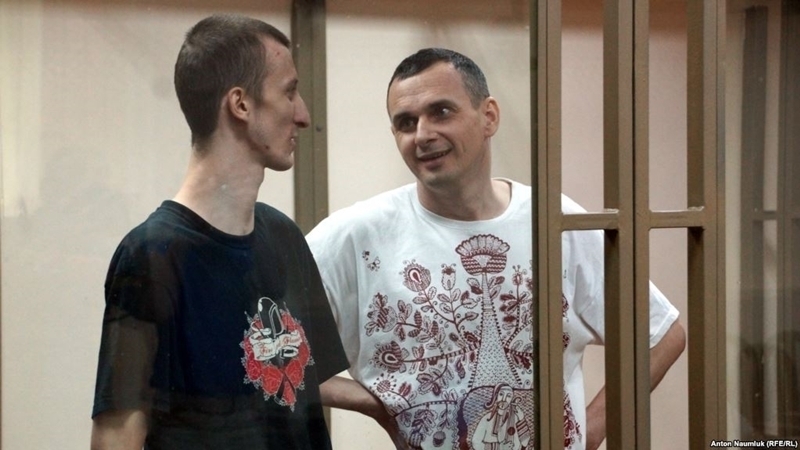 The graffiti depict the political prisoners Oleg Sentsov and Oleksandr Kolchenko behind bars in the Russian court. It is worth noting that the graffiti were placed under mural with President Vladimir Putin and the inscription: "Crimea is our common property." “Keep silent or get punished” reads the inscription near the graffiti. Earlier, an action was held in Paris in support of Oleg Sentsov, Oleksandr Kolchenko and other political prisoners. The organizers of the event were two associations in Paris: Ukraine Action and Kolchenko's Collective. Previously, more than a hundred people gathered on the Independence Square in Kyiv to support Oleg Sentsov and other political prisoners. A complete list of the Kremlin’s prisoners was read out during the rally, which includes more than 70 names of illegally detained and convicted people in the territory of the Russian Federation and in the occupied Crimea.